At some point in our lives we will all come across that one moment when we realize our vision isn’t quite as strong as it once was. The thought of reading a menu without your glasses resting atop the bridge of your nose seems ludicrous. Is this deterioration in vision something to simply be chalked up to the aging process or could it mean something more? 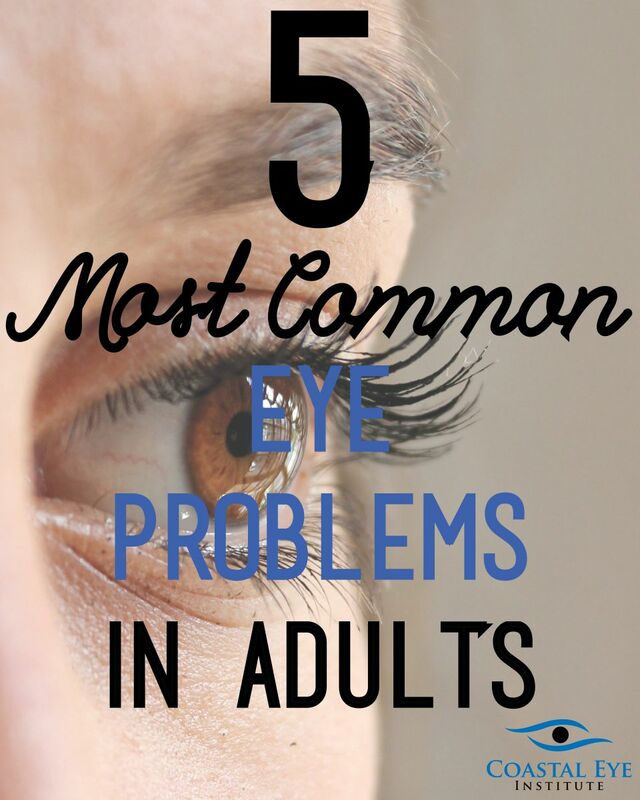 Here are 5 of the most common eye problems that occur in aging adults. Cataracts occur when the lens of the eye begins to become cloudy. They are not contagious and cannot be spread from one eye to another. Cataracts are quite common and we have found that most people with cataracts have had a lens replacement by the time they reach the age of 80. What is a lens replacement, you ask? A lens replacement is when the cloudy lens of the eye is removed and replaced with a new transparent lens called an intra-ocular lens. This allows the eye to focus light more effectively and allows the lens to adjust focus for various distances. Glaucoma is an increased intraocular pressure, or pressure within the eye. If left untreated, this pressure can cause irreversible nerve damage to the retina and optic nerve. This damage can lead to vision loss and potentially blindness. A build up in pressure occurs when the flow of aqueous humor, a fluid in the eye, is slowed or blocked. There are two types of Glaucoma: Open-Angle and Closed-Angle. Open-Angle Glaucoma has no visible symptoms. With this type of glaucoma vision loss will occur in the peripheral vision. Closed-Angle Glaucoma brings on symptoms that include blurry vision, rainbow halos around lights, pain in the eyes or head and sudden loss of vision. Diabetic Retinopathy is a complication that can occur in diabetic patients. This disease negatively affects the function of the retina causing the blood vessels that nourish the retina to become damaged. This damage results in permanent vision loss. Some potential symptoms of Diabetic Retinopathy are floaters, blurred vision, vacant spots in the center of vision and difficulty with night vision. Retinal Detachment is the separation of the light-sensitive top-layer of the retina from the under layer. Potential causes of retinal detachment are myopia (nearsightedness), genetics, trauma, uncontrolled diabetes and history of retinal surgery. Symptoms include flashing lights (usually in the periphery), unusual blurred vision, shadows or darks pots in the vision of one eye. There are two main treatments for retinal detachments. In some cases lasers are used to seal holes and tears in the retina. In other cases, an instrument such as a glass bubble, may be placed into the eye. This procedure allows the surgeon to gently push the retina back into place. Blindness can develop as a result of an eye problem. Traditionally, blindness is the total loss of vision in one or both eyes. The leading causes of blindness are cataracts, glaucoma, diabetic retinopathy and macular degeneration. If you or someone you know if suffering from the symptoms from any of these eye diseases, contact us today. Coastal Eye Institute has 11 outstanding fellowship trained ophthalmologists who are experienced in every area of eye care.